Prior to remodeling the lower level of the house and the stairs, there was a wrought iron gate that closed over the third step of the lower stairway. 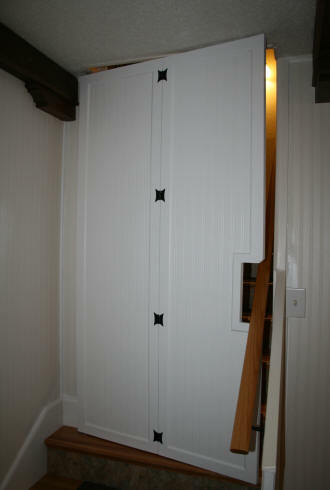 I had removed this gate which was attached to a banister to place wallpaper on the wall it was attached to. I decided to get rid of the wrought iron and built a continuation of the wall down to the bottom level so the stair handrail would go all the way to the end of the stairs instead of stopping at the end of the wall. So now there was no way to close off the two levels of the house. Or lock the dogs downstairs. The other reason I thought about creating a door to block off the lower level was a bad freeze we had in El Paso in February of 2011. During the winter we do have overnight hard freezes but it warms during the day. So we do not stay below freezing very long. We cover delicate plants and worry little about outdoor water pipes freezing. February 2011 was a different story. We had several consecutive days of a hard freeze that stayed below freezing during the day. Which means, if you had unprotected pipes outside, they froze. The City also lost about half of it's plants and we don't have much to begin with. During this freeze, the power company had trouble keeping the power on. We had rolling blackouts which meant bye-bye heater. To contain the heat to the upper portion of the home, I blocked the downstairs vents and put plastic sheeting over the stair opening to block the two levels of the house. With a couple of extra sweaters on, we were OK. Yep, I had a pipe outside that burst (along with the rest of the city) and half of my 30 year old plants died. fold-up in the recessed area on the left I wanted a door that would go across the opening on top of the third stair. 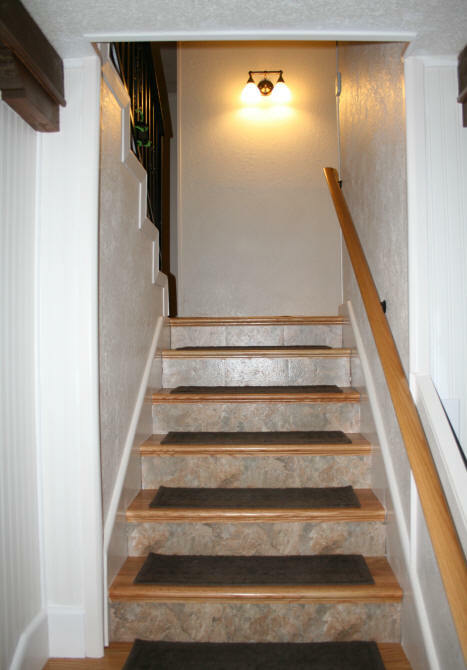 So I went searching around on the internet for door ideas for a stair. I found doors at the top of stairs like for a basement stair opening. 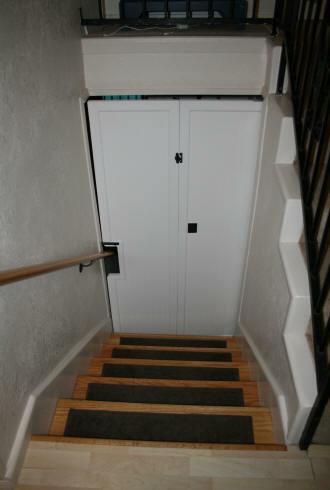 Doors under stairs like for a under stair closet. I however did not find any doors that actually went across a set of stairs. I guess I am the only one in the world that wanted to do this. I did come across some fire codes that would prohibit building a door in the middle of the stairway. Which makes sense. In my case, there are windows and three doors leading outside on the upper levels. This stair door was not going to be something so massive you could not kick it out if needed. I also intended to use the recessed section you see on the left side of the photograph to store the door most of the time. So the door is rarely used but is there in case we need to. I quickly determined after doing measurements, that the door would need to be a folding door or it would block the laundry room door. 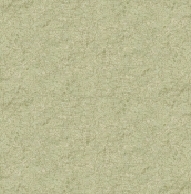 I looked at pre-made doors for closets, but the exact size I needed was not a common size. So I decided to make the folding door from scratch. The other thing to consider was how to hang it. After spending so much time repairing this little corner of the wall from extensive dog damage, the last thing I wanted to do was to slap two or three hinges onto the wall, like in a regular door frame. I decided on pivot hinges. If your not sure what these look like, look at the heavy glass doors in an office or store. You can also find these on cabinet doors. All I would need to do is drill a hole in the stair tread and another hole in the ceiling. I went to the local big box stores looking for pivot hinges. The staff looked at me as if I was speaking gibberish when I asked if they had any. 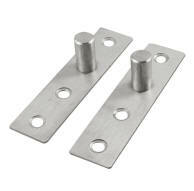 For the most part, you can find them in the folding door replacement part section of furniture hardware sections. But they are wimpy. I needed two pivots made from sturdy pieces of metal. You can also find commercial websites which sell the pivots for the large glass door. In my case this was overkill and very expensive. Again, I searched for days on the internet, using different search terms and looking at 1000's of photographs for the perfect pivots. I finally found them on Amazon from a company in Hong Kong, and yes, I had to wait a few weeks before they arrived to be sure they were the pivots I needed. They were! The pivot section was 12mm (approx 1/2") across and the flat portion where the screws go through was good and strong enough to support the weight of the wood. I purchased a sheet of 1/2" blondewood at the hardware store and cut two pieces to size for the panels. I placed molding around the edges on both sides. 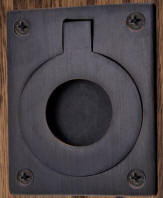 The moulding around the edges helped make the two door panels an inch thick so that the pivot hinges would be flush to the wood at the top and bottom. 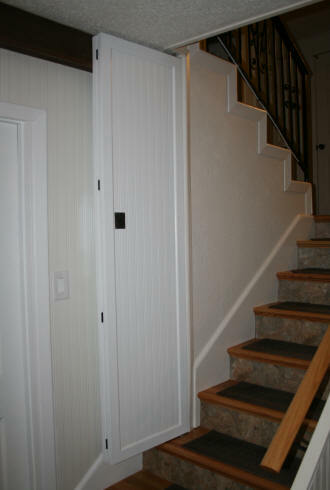 I had to make a cut in one section of the door to allow it to pass over the stair handrail. This took some experimentation to make sure the hole was large enough. I finished the wood panels off by placing the beadboard wallpaper I used in the downstairs den walls and painting them white. I purchased some plastic grommets to place in the the holes I needed to drill for the pivots. I drilled the holes in the stair tread and ceiling. Placed the grommets in with wood glue and in the case of the ceiling hole, a whole lot of caulk. It took several days for the ceiling hole to set. It was not easy getting the pivots in the holes and the door not fall out. I ended up putting a metal washer on the bottom pivot, straighten the door into place, put the upper pivot into the hole and THEN screwing in the top pivot to the door. If I had spring action pivots I would not have had to do this. Yes, the door was placed up and taken down many times before I got it to work properly. There was also a problem with the opening around the stairs. The stair rail side was one inch lower than the other side. So I placed a thin wood wedge between the bottom pivot and the door bottom to make sure it hung at a very slight angle to compensate for the lower edge. In addition, I had to remove the corner molding on the ceiling and shave the ceiling down a little. Believe it or not this one inch difference is not even noticeable until you pull out your measuring tape. All that was left to do was to get the rest of the hardware I needed for the door. For the hinges, I just didn't want regular door hinges...boring. So I looked for something a little more decorative but I was not going to pay big bucks per hinge. 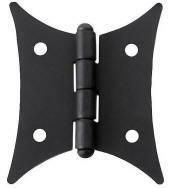 I came across these butterfly hinges on Amazon from B&M Hardware. I ordered 2 sets of 2 to see if they would work on my door. They were not as large or as sturdy as I had hoped they would be and are really more suited for furniture doors. I went ahead and tried them out on the two door panels to see if they would work and they did. I used all four. I wanted something to pull the door out of the recess without touching the wood every time. But I did not want a knob that stuck out on the door. I wanted the door to be flat against the wall when not in use with nothing to catch on clothes if someone was going down the stairs. 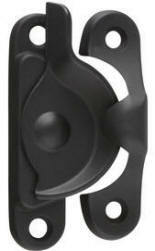 I decided on the recessed door pull from Signature Hardware. I bought two planning to use them on both sides of the door but ended up only using one. I carved the space in the wood for the pull before I put on the wall paper and paint. Sash lock and strike One piece of hardware I also needed was something to hold the two panels of wood rigid on the side opposite of the hinges . If not, the door would be easily pushed open if pushed on in the center. Something the dogs could easily figure out if locked in upstairs. I went to the hardware store looking for something that would work. I did not know what it would be but would know it when I saw it. 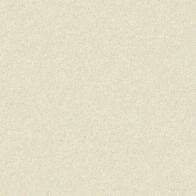 I saw it! A sash lock and strike which is normally used for windows. The sash lock and strike keeps the two panels rigid and keeps the door from opening all the way on the other side of the door. Which means when it is locked, you cannot get upstairs. I also needed to be able to bolt the door closed so I purchased a slide bolt entry door chain guard. Both pieces of hardware were purchased at Lowes and are part of their Gatehouse line. The bolt slides into the moulding on the corner of the wall. The photo on the left shows the door in the recessed part of the wall. 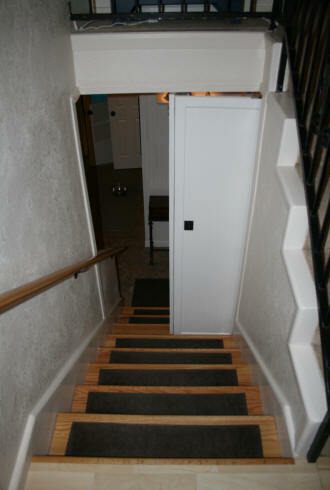 The photo on the right shows the door at the bottom of the stairs locked straight and partially open. When the door is straight like this, it will not open all the way. The stair handrail stops it. To store the door away, you have to fold the door in half and then push it into the recess. From the top of the stairs looking down upon the door. 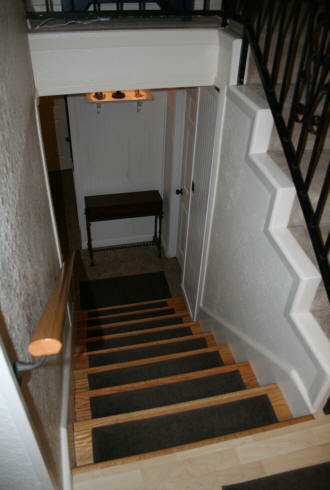 When the door is in the recess, it does not block the stairs. The door can also be opened in half if we want. The fit for the door was so tight at the bottom, the carpet tread has to be removed to operate the door. The view of the door from above when locked in place. Yes, there is a 4" gap at the top of the door. The door was not meant to be air tight. For the dogs, it keeps them downstairs and allows us to peak in at them. If there is another bad freeze, all I have to do is place a folded towel or blanket on top of the gap and around the stair handrail.